This issue of 19 on ‘The Arts and Feeling’ explores the ways in which Victorian writers, artists, composers, sculptors, and architects imagined, conceptualized, and represented emotion. Its diverse articles respond to and extend recent interdisciplinary work on emotions, sentimentality, and the senses, locating such work within wider debates about the physiology and psychology of aesthetic perception, the historicization of aesthetic response, and the role of media specificity in the production of affect. What were the expressive codes and conventions that resonated for the Victorians? And what of the terminology used today in academic discourse to locate, recognize, and describe feeling? ‘The Arts and Feeling’ interrogates such questions in relation to canonical artworks, like John Everett Millais’s Autumn Leaves or William Holman Hunt’s The Awakening Conscience. It investigates the role of feeling in religious visual and material culture, and in John Ruskin’s vision of architecture as an emotional art; it looks at Victorian exhibition culture and the ‘hurried’ nature of aesthetic response, and at women viewing art and the gendering of perception. Vernon Lee offers us ‘historic emotion’, while George Eliot’s The Mill of the Floss makes us think about feeling hungry. Richard Dadd’s Passions series stages interaction between madness, visual culture, and theatricality; and the Aesthetic Movement provides opportunity to reflect on the relationship between art and music and how, together, they both produce and repress emotion. When the flagship Journal of Victorian Culture announced its intention in 2008 to “act as a forum for digital research on the nineteenth century and for discussion of its relationship with traditional scholarship,” it was an acknowledgement that a wide range of nineteenth century research communities had become actively engaged with the imaginative and critical possibilities opened up by the digital world. Since then, its ‘Digital Forum’ section has included challenging work from a wide range of perspectives and chronicled the growth of this discipline over the past eight years. Similarly, since Dickens Journals Online was launched publicly in 2012, the digital reception and exploration of Victorian periodicals and Dickens’s work has enjoyed an exponential growth; last year’s Being Human festival offered a showcase for some of the most interesting and innovative digital Dickens projects happening today, including The Drood Inquiry and the Our Mutual Friend reading project and Twitter group. Most recently, Birkbeck’s online academic journal ‘19’ (itself an innovation in digital studies of the long nineteenth century) devoted its entire 10th anniversary edition for Winter 2015 to lengthier meditations on an array of exciting endeavours within the burgeoning nineteenth-century digital archive, including the digitization of Blake’s work and the cultivation of new research networks and discourses through digital projects. 19 marks and celebrates its tenth anniversary with a special issue guest edited by Luisa Calè and Ana Parejo Vadillo on the manifold possibilities of the nineteenth-century digital archive. What old and new crafts shape the nineteenth-century digital archive? How is the nineteenth-century paper archive remediated and remixed in the twenty-first century digital archive? What kinds of authors, users, and citizens do nineteenth-century digital projects call for? And what shape do they take? These are some of the questions addressed in this tenth anniversary issue of 19: Interdisciplinary Studies in the Long Nineteenth Century dedicated to the Nineteenth-Century Digital Archive. In ‘The Craft of the Archive’, Morris Eaves and the Blake Archive team address the digital palimpsesting of William Blake’s Four Zoas, whereas Jason Camlot discusses digital forensics, audio fossils, and analyses early voice archives. The Our Mutual Friend Reading Project, Birkbeck’s durational interval reading experiment, is discussed by Ben Winyard, Emma Curry, and some of the project’s digital personae: Beatrice Bazell, Holly Furneaux, Pete Orford, and Melissa Symanczyk. The ‘Experiments’ section features Nadia Valman’s Zangwill’s Spitalfields app, Bob Nicholson’s Victorian Meme Machine, and Rob Gallagher and Ana Parejo Vadillo’s remix of Michael Field’s Sight and Song. Finally, in ‘Visions’ we explore the Internet Archive with Brewster Kahle; Gale Digital Collections with Ray Abruzzi; the Central Online Victorian Educator with Dino Franco Felluga; Citizen Science with Sally Shuttleworth, Gowan Dawson, and team; Lost Visions with Julia Thomas; nineteenth-century periodicals with Laurel Brake and James Mussell; and conclude with Hilary Fraser and Jerome McGann reflecting on digital nineteenth-century worlds past, present, and future. We are delighted to announce that 19: Interdisciplinary Studies in the Long Nineteenth Century at http://www.19.bbk.ac.uk has had a makeover. 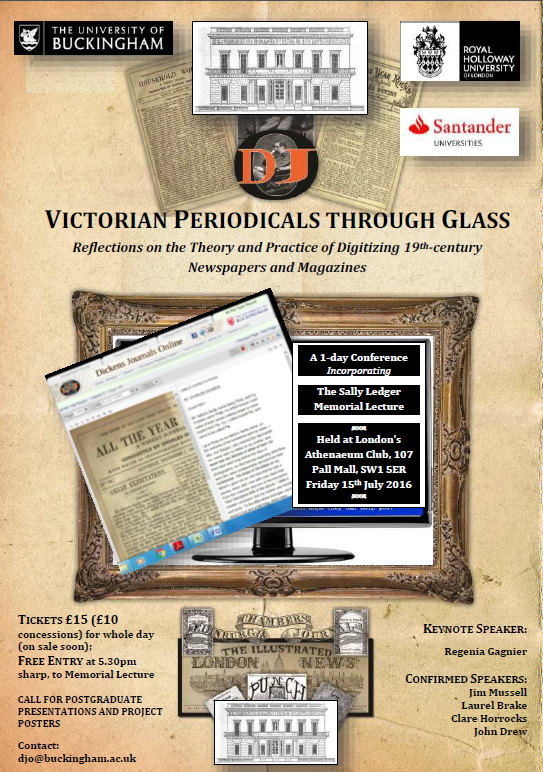 We hope you’ll agree that the journal is looking very good as it prepares to celebrate its first ten years this autumn. 19 publishes two themed issues per year under the auspices of invited guest editors. It is part of Birkbeck’s Centre for Nineteenth-Century Studies and is under the general editorship of Dr Carolyn Burdett. The journal is now proudly housed within the Open Library of Humanities (OLH), a platform for open access publishing also based at Birkbeck. The OLH has a unique model to fund open access journals in the humanities that doesn’t rely on author charges but instead receives support from a large number of libraries. Please do see their website at https://about.openlibhums.org for more on getting your libraries involved or to learn about moving other journals to their model. The Crimean War (1853–56) is much more culturally significant than its popular mythologies suggest. Now remembered mainly for the Charge of the Light Brigade and the Lady with the Lamp, the war is a pivotal moment in the history of modern warfare seen as both the last of the old wars and first of the new. The first total war, it inaugurated new forms of weaponry, tactics, communication, war reporting, military medicine, and new attitudes towards soldiers. The issue provides a number of new perspectives on these features of the war as it played out in the British, French, and Russian imagination. Contributors mediate the vexed issue of medical provision for the British and Russian armies; sensitivities around Britain’s military alliance with France; royal and poetic interventions into the welfare of the British soldier; the religious, commercial, and emotional investment in soldier-heroes like Captain Hedley Vicars and the Light Brigade; the memorialization of the final action of the war, the fall of Sebastopol; and, finally, the war’s continuing cultural and geopolitical relevance. Incorporating statistical analysis, journalism, photography, objects, art, film, and literature, this issue of 19 makes a case for the conflict’s wide-ranging significance.